Homemade bone stock or broth should become a staple for anyone who’s starting a journey into Paleo and lifestyle. If you’ve never had it, you’ll discover that you can use it regularly for soups, sauces, stews, curries and just about any dish that requires cooking a piece of meat or vegetable in a liquid. Bone stock or broth might be about the last nutrition powerhouse that a lot of Paleo dieters aren’t making use of. Bones should be a main constituent of your diet along with fresh meat and fat from animals, organ meats and nutrients from fruits and vegetables. They’re also dirt cheap, literally, coming in pound for pound at a lower cost than topsoil. If you utilize all the bones from the meat you eat, you’ll be getting them free. This reason alone is enough for you to consider choosing bone-in meats when you can. If you don’t, you can still ask your butcher for bones and he’ll be happy to sell you some for a very low price. You can make stock or broth from virtually any kind of bones including those from chicken, beef, pork, lamb, and fish. If you’re fortunate enough to have access to game meat, wild animals have some of the healthiest bones because they eat a diet that’s evolutionarily correct for their digestive systems. Their bones contain all the nutrients they need, and game makes delicious stock. Bone stock contains 2 important amino acids – proline and glycine – in addition to minerals and collagen. Glycine supports detoxification and helps the body synthesize collagen. It aids in wound healing and supports the release of growth hormones. Proline tightens and builds cell structures, strengthening them. A strong collagen structure heals leaky guts, reduces the appearance of cellulite, and improves the strength of skin and vein walls. A good stock will be gelatinous after it has been cooled. Concentrated stock where a great part of the gelatin has been extracted from the bones will be thick and gelatinous when cold. It makes a wonderful cold weather drink straight from a mug, and works wonders when you’re feeling under the weather. It’s especially helpful for people dealing with digestive problems or gut flora imbalances. Nutrients that we seldom get in our modern diets, such as collagen, gelatin and glucosamine, are extracted. These nutrients are some of the main building blocks of the digestive system and help it stay healthy. If you’re not a big fan of precise recipes when there is no need for them, and you favor simplicity, stock making may become a habit for you because it’s easy, versatile, nourishing, and delicious. Simply place a big bunch of bones in a crock-pot or a big stockpot, cover them with cold water and set the temperature on low heat so it doesn’t do much more than simmer. Add 2 tablespoons of apple cider vinegar to the cold water to help draw the nutrients from the bones. You can roast your beef bones beforehand for 25-30 minutes at about 375oF (190oC) and then use them to make your stock. This technique makes a much darker stock with a roasted flavor. You can easily mix things up and use bones from different animals all in the same pot. A lot of people will tell you to skim the froth that forms at the surface of a stock as it cooks, but it’s harmless. Skimming the foam or “scum” as it’s sometimes called, is simply a matter of culinary preference and is done to create a clear broth or stock. If you don’t mind the way it looks, leave it and all the goodness that it might contain. People also like to remove the congealed fat that forms at the top when the stock is cooled. You can leave it in or pull it off, whichever you prefer. If you’re eating grass fed and pastured animals, the fat will be healthy for you. Allow around 4 hours for chicken stock and a minimum of 6 hours for other, tougher bones. You can easily let it go for much longer if you want to extract more taste and nutrients from the bones, as much as 48 hours. Just make sure you add water as it evaporates and continue drawing out the concentration. Chicken bones are more fragile and after 24 hours there won’t be much left. Seasoning should be done near the end of the cook time or you can wait to season your stock as you use it in recipes. Add fresh herbs and spices in the last 10 minutes. Dried herbs and spices or spice powders can be added during the final hour. Vegetables can be added according to their size, giving them enough time to cook. If you’re not skilled with seasonings, it’s best to experiment with a small amount before seasoning the entire pot. You’ll discover different flavors that you may enjoy for a variety of dishes. An important rule when it comes to stock making is don’t add any salt. If you plan to reduce it to make soups or sauces, the salt concentration can easily become too high if you add it at the beginning. Only add salt to the end product you make with the stock, not to the stock itself. French people always come up with great names when it comes to cooking. Use mirepoix for sauces and bouquet garni for soups and stews. A mirepoix is usually a mixture of diced carrots, celery and onions. It’s used everywhere in French cuisine to flavor liquids because those vegetables impart great taste. Add them only at the end if you’re going for a 24 or 48 hour cooking period or they’ll disintegrate too much. They can be discarded afterwards because all the flavor and nutrients will be in the liquid. Try turmeric or fenugreek powder for soups and straight broth, oregano, ground fennel seeds, or even a little nutmeg for stews and gravies. After your stock is cooked, it’s a good idea to cool it quickly because bacteria will multiply rapidly. Putting the hot pot directly into the refrigerator will raise the refrigerator temperature to unsafe levels for food. Instead, take the whole pot and put it in a sink filled with cold water. After it has been cooled, separate what you plan to use right away and put it in the refrigerator. It will keep for about a week. Use the smell test. If it smells good, it should be fine. If you’re not sure, re-boil it to kill any bacteria. Store the rest in the freezer. If you’ve made a very large pot, it’s convenient to store the remainder in one cup portions so you can defrost them as needed. Once you’ve made this delicious liquid, you may find yourself using it in all kinds of recipes including soups, stews, meatloaf, stuffed mushroom fillings, meat pies, and even desserts. Here are some suggestions to help you get creative. If you own a high powered blender, try this instead of caffeine in the morning. You’ll get a blast of nutrients that will keep you going for hours. Push all ingredients down into the blender cup and pour stock over them. Blend until plants are liquefied. Tip: Freeze your fresh greens and fruits for a refreshing cold drink, or warm the blended drink lightly on the stove during cold weather months. Don’t boil or even simmer the drink or you’ll lose the antioxidant properties of the plants. Just warm it over low heat. This soup makes 4 generous servings and can be made in 1 hour. Impress your dinner guests on a cold winter evening. Add about ½ of the stock to deglaze the bottom of the pan. You won’t believe how good these donuts are, and no one will ever know you’re feeding them something so healthy. Preheat oven to 350oF and grease the insides of your doughnut pan really well. Bake 20 minutes. Let cool for 10 minutes in the pan, and then remove to a cooling rack. Dip the top of each donut in the chocolate then gently rotate the donut to let the excess glaze drip off. Turn right-side up and place back on the cooling rack. Sprinkle bacon bits onto chocolate glaze before it hardens, a few donuts at a time. Let set for 5 minutes, then refrigerate for 15 minutes to harden glaze. Combine all bread ingredients in a mixing bowl and mix well. Pour into a greased bread pan and bake for 32-45 minutes or until golden brown. Use a toothpick to test the middle for doneness. If it comes out dry, your bread is done. If the top starts to get too brown, cover with foil. Let cool in pan for 10 minutes, and then remove to a cooling rack to cool completely before glazing. Mix all glaze ingredients in a small pot over low heat until it just starts to simmer. Remove from heat and let sit to cool. Once cooled, put in the fridge to firm up. Once loaf is cooled and glaze is firmer, drizzle glaze over the top of loaf. Refrigerate the loaf 30-60 minutes to firm glaze further. Glaze will not harden. Cover and store in refrigerator. A plastic container with a lid works well to avoid smashing the glaze. 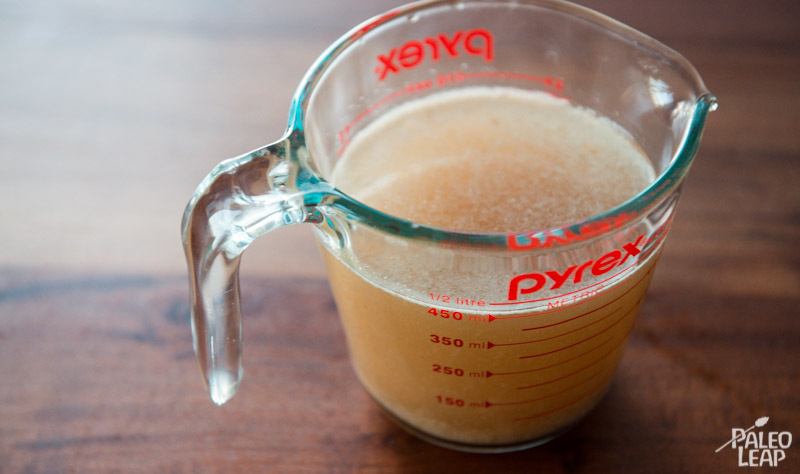 You can use bone stock wherever a recipe calls for liquid. 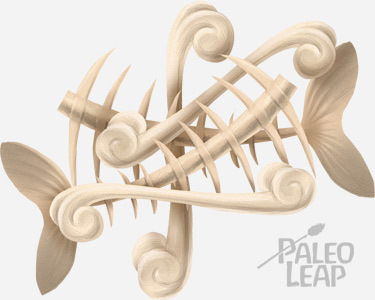 Coming up with creative ways to use it is part of the fun of a healthy Paleo lifestyle. Look at it this way. Caveman didn’t have a stove or an oven, so we’re at least one step ahead of the game.